Alternative Polo pedal box fix. Cheap, Easy and tough. This was done to my 1999 Seat Ibiza which I believe uses the same pedal box. I would imagine the areas mentioned in this guide, namely the auto adjusting clutch cable and the hole in the firewall are also very very similar and therefore with possibly minimal changes this can be used for the Polos manufactured around 99-02. My alternative pedal box fix. This works even if your pedal box is cracked and broken, as long as the main structure that bolts it to the car is ok.
Time taken: few ours after work. !! Firstly it is wise to cheack you can reset your self adjusting clutch cable. Took me 2mins and was simple !! 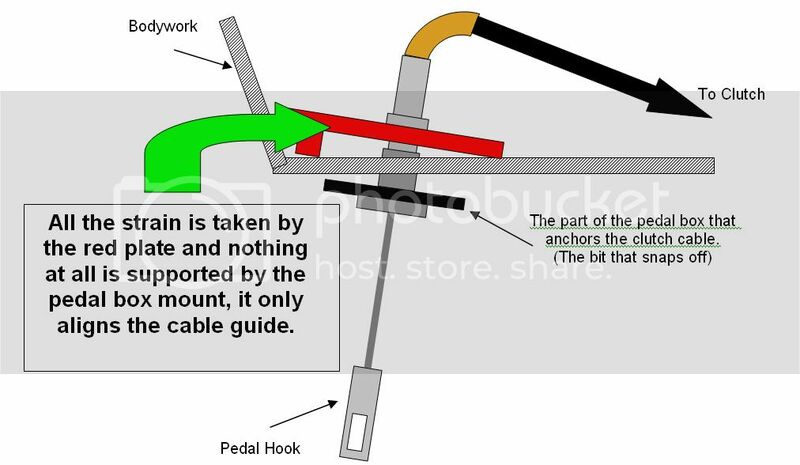 Unhook the cable from the gearbox. Now press the pedal all the way down then pull back up. Now go under the bonet and pull the cable (not the outer, just the wire) and the rubber adjuster should compress and your cable will get longer. It should now be too long to hook on to the gearbox. If not try again. Once it has reset put the white clip on the adjuster to hold it shut until after the job had done. 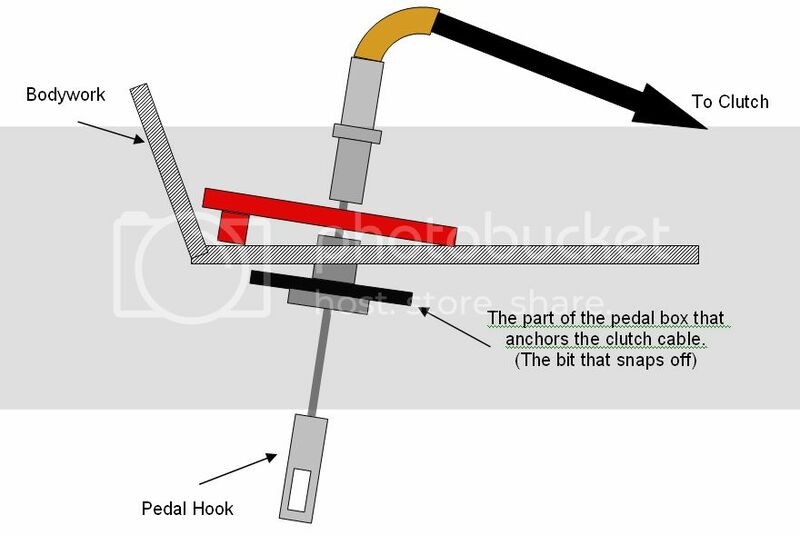 All the trouble comes from the fact that the cluch cable mount can't take the strain of the clutch and eventually snaps. My solution was to remount the cable the other side of the bulkhead on a home made steel plate. Problem solved. It may be best to view the area your working with, this is where the clutch cable enters the cabin through the firewall. It's behind the wiper motor. So take off the wipers, plastic cover under the windscreen and wiper assembly. Note there is a small pug under the wiper motor that you may not see at first. Takes 5mins. 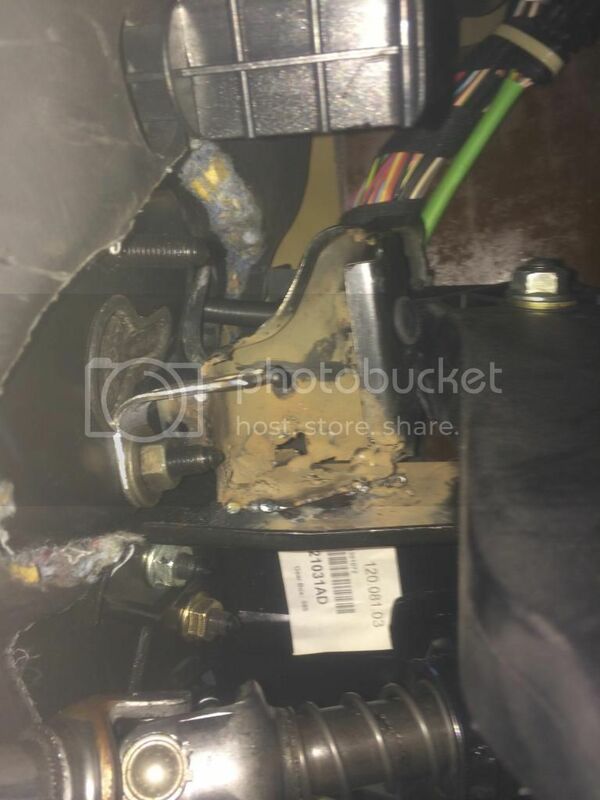 In this pic, just to be clear, the upper area is behind the wiper motor where you've just uncovered and the lower area is above the clutch pedal in the footwell. Back under the bonnet you will now be able to pull the cable assemble entirely out of the cabin through the firewall, including the pedal hook, and see the tubular mount still left attached to the pedal box through the hole. Any old bit of metal will do as long as it's strong and fits. 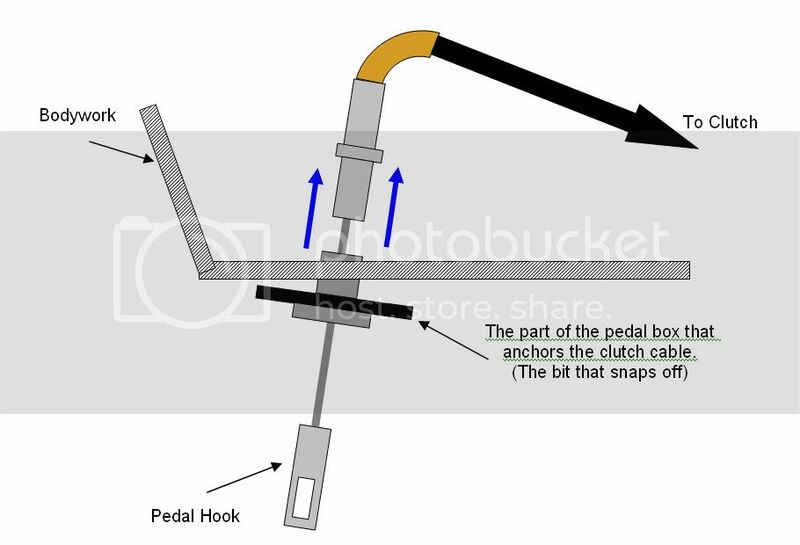 The spacers are to raise the plate to the same angle as the OEM clutch cable mount on the pedal box. (The plastic tube you pulled the clutch cable out of). Final dimentions are up to you as I didn't measure anything I just made it by eye. Pull the rubber gromit off the clutch cable, cut a bit out the middle and put it back in the hole in the firewall with the OEM cable mount just poking through. This will stop fumes or damp. Next feed the cable through the new plate until the plastic guide mounts securely in the 17mm hole. Feed the cable back through the fire wall and old mount in the pedal box. 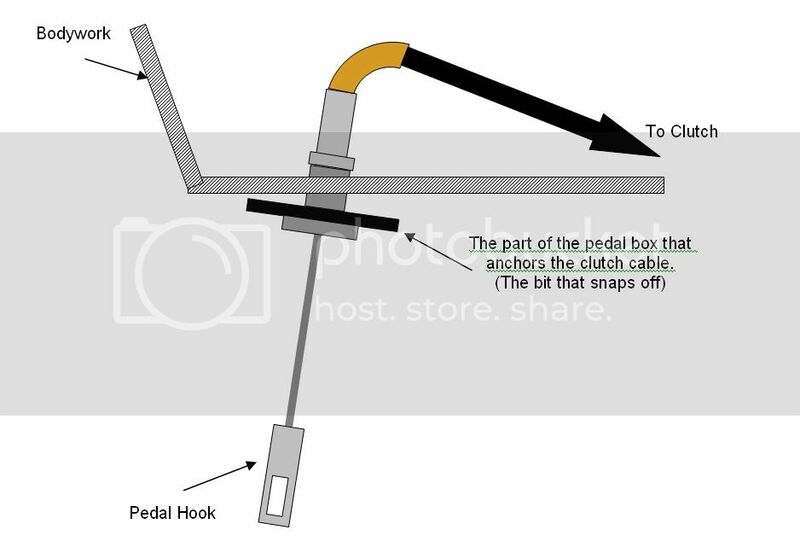 Make sure to olny re-attach your clutch cable if you have reset it or it will be too short. Attach both ends of the cable before unclipping the white plastic thing. Now pump the pedal slowly 5 times to take up the slack. It should feel like a new one. Make sure the car moves and the clutch works at this point and then put everything back on the car. Please leave feedback or alterations. Hope this is of some help to you guys. You might want to make this a sticky or post in the FAQ section. This looks good as I can hear some crunching from my daughters clutch pedal. Has anyone tried this - can you confirm that it helps? If so it will save me either loads of money or loads of time!! Going to be trying this soon. How does it stay there if its not bolted to the body? Took me bout 8 hours to change the box. Steering wheel off and all lol.